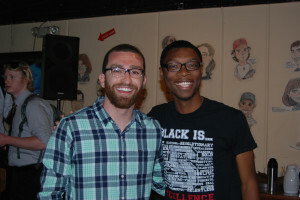 ASSU President Robbie Zimbroff ‘12 and Vice President William Wagstaff ‘12 have appointed their executive cabinet and made headway on several ASSU programs. “A big [goal] for me is doing what we said we were going to do,” Wagstaff said of the ASSU Executive’s priorities this year. Their campaign platform, based on principles of practicality and common sense, included objectives to encourage public service engagement, expand participation in athletic events, increase late-night options and streamline a textbook exchange. After soliciting applications through public email lists and interviewing candidates, Zimbroff and Wagstaff selected only three students for their executive cabinet. The president and vice president said that they chose their new cabinet members, Anjney Midha ‘15, Kaela Farrise ‘14 and Norian Watson ‘13, because they wanted students representative of different aspects of the University who were able to communicate and work with lots of different people. Midha serves on the branding team at the Business Association of Stanford Entrepreneurial Students (BASES) and is involved in the entrepreneurial community. Farrise is the co-president of Project Motivation, a service-based voluntary student organization, and is involved in other several Haas Center programs. Watson has worked as a resident assistant (RA), a student leader of the Caribbean Students Association and a student representative on the Committee on Land and Building Development. Zimbroff and Wagstaff’s final cabinet of three will be much smaller than those of previous administrations; the 2011-12 and 2010-11 executive cabinets had 16 and 12 members, respectively. They have said that they hope the smaller cabinet will encourage a “big picture” approach, and that it will involve all members in a variety of student life projects. It is also the first time in at least three years that the Executive has waited until the summer before accepting applications for cabinet positions. In addition to the downsizing, Zimbroff also said their cabinet will be more team-based and less hierarchical than those of the past. Over the past two months, the Executive team has worked with the Sexual Assault and Relationship Abuse Office to design a presentation for incoming students. Wagstaff said that they hope to launch the presentations, which may include a student panel, in freshman dorms by late October. They also worked with class presidents to organize a tailgate on Sept. 27, when the Cardinal football team travels to Washington. “The first football game of the academic year is away…[but] we didn’t want people to miss out on the experience,” Zimbroff said. The pair has also been planning campus engagement events for the upcoming Alternative Review Process (ARP) discussion and debate. Instituted as a two-year pilot program in 2010, the ARP, which regulates the judicial procedure for students charged with sexual assault, was up for ASSU review last spring. However, following contentious debate, the Undergraduate Senate chose to defer the vote to this fall. Zimbroff said they are hoping to host a town hall and anonymous web forum within the next six weeks to inform students on the ARP and solicit feedback on its controversial procedures. “One of the things that you’re trying to overcome is that not everyone knows what the ARP consists of. So you want to educate people on what is going on,” Zimbroff said. As part of their platform objective to expand late-night food options, the team has also worked to bring more food trucks to campus. However, Zimbroff said that they are still working through logistical problems, including meeting health code regulations, finding parking space, ensuring proper licensing and arranging management and liability contracts with the University. He said students can expect late-night food trucks by the start of winter quarter. The Executive team has seen less progress in its attempt to bring food from local restaurants onto campus. Wagstaff said the restaurants they have contacted have inflexible polices that prevent them from serving or distributing to Stanford late-night institutions. “To be honest, it’s been more frustrating than we hoped for to get [restaurants] to agree to have later hours or lower minimum orders,” Zimbroff said. Following discussions with administrators, Wagstaff said that they have abandoned efforts to create a new textbook exchange because of existing entities that perform the same service.